How to Draw a Dragon: "Cautiously approach the dragon, offer it a piece of candy or a little sister, and draw while it happily munches away." From the artist behind the wildly popular NeonDragonArt.com, DragonArt will help you create mythical beasts that awe, delight, and disturb the sweet dreams of little ones. Armed only with your trusty pencil and ink pen, you will begin your artistic quest by conquering a super-easy dragon that even the densest of wyvern could draw. 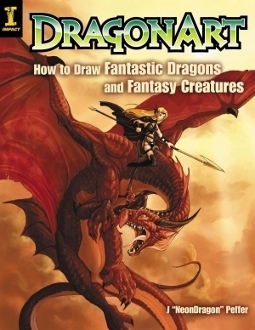 With pace quickened by this cool achievement, you shall forge bravely onward to discover simple secrets and spiffy tricks for making your creature friendly or fierce, sorrowful or cynical—drawing them from all different perspectives, in flight or at rest (so vain, those dragons—they love to strike a pose!) and incorporating various styles of heads, limbs, wings, horns, frills, scales, tails and other details to make your particular beast original, believable and so darn groovy. 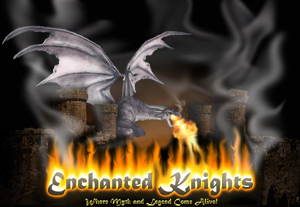 Because dragons enjoy having others around to terrorize, disembowel and occasionally hang out with, this book will also teach you how you to populate your alternate universe with a whole cast of fantastic creatures, including mythical griffins, guardian gargoyles and deadly basilisks. All this within the curiously compelling, beautifully beastly, and brightly colored pages you hold in your hands, which by now are no doubt trembling with keen anticipation. So quit dragon your feet! (Ugh, wyrms hate puns!) Buy this book now and make your wildest, wickedest, fire-breathingest fantasies come true!